The California Department of Transportation (Caltrans) said Monday's mudslide is 100 ft. in length and up to 4 ft. deep and occurred about 6:30 p.m. Both Nevada and California highway officials said there's no estimate for reopening the route in the area approximately 50 mi. southeast of Lake Tahoe. For northbound traffic, the closure begins just north of the California agricultural inspection station, the Associated Press (AP) reported. The region has been experiencing thunderstorms and heavy rain, in addition to a recent Slinkard Fire in that area, which contributed to the debris flow, officials said. The nearby Topaz Lodge had approximately 200 people in it at the time, according to AP and people there were escorted north on 395 by Nevada Department of Transportation (NDOT) and NHP. A couple of areas nearby were completely impassible, affecting about 20 cars. There were no reported injuries. Crews are doing further investigations into homes and county infrastructure below the lodge and along Topaz Park Road. Officials told KTVN 2, a local news affiliate, that that US-395 from SR-208 to the Nevada/California state line is closed. The first mudslide occurred at the Topaz Lodge and was 8 ft. at its deepest points and more than 100 ft. across the roadway, KTVN reported, and resulted in mud and water damage in five rooms at the Lodge as 200 people were evacuated to the second floor. One semi-truck got stuck, but the East Fork Fire Department was able to extricate the occupants; fifty other cars at the Lodge could not leave for a short period of time. The second mudslide occurred a little north on US-395 and was around 3.5-ft. deep and two vehicles were stuck; the East Fork Fire Department extricated those vehicles and occupants, as well. Douglas County Sheriff's Office, NDOT and Caltrans also responded to the mudslides. 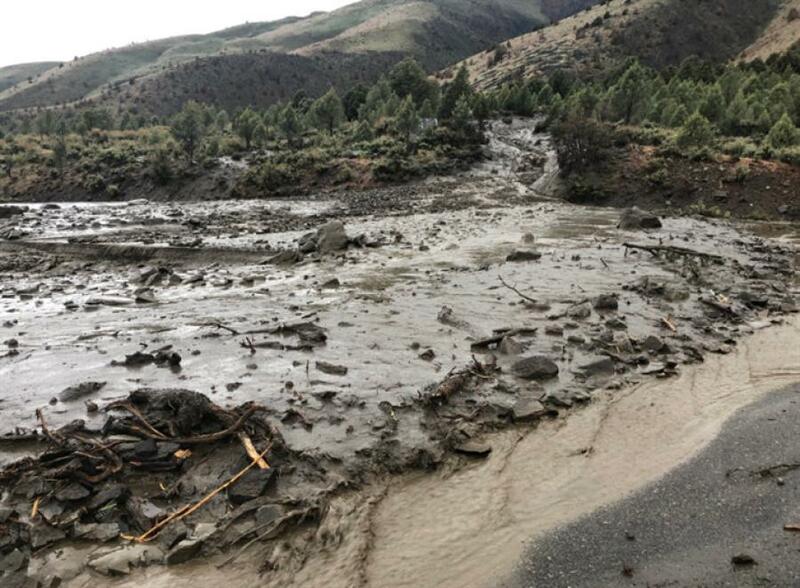 The East Fork Battalion said approximately 130 people are helping to clear mud and debris from the roads, including crew members, agencies and volunteers, KTVN reported. Currently there is one lane open to the Lodge, with a detour available past the Lodge.